Setting highest placement record in 2015-16 as well, Lovely Professional University is making new strides in placements of its students in top brands every year. International placements by Qatar Airways at highest salary package of Rs 20 Lakh and Hyatt Hotel USA at Rs 15 Lakh are highlights of the session up to now. Other top salary offering companies remained Air India (Rs 8.5 Lakh), Practo Technologies (Rs 7.08 Lakh), Josh Technology Rs 6.5 Lakh, LG Soft (Rs 5.5 Lakh) and many more. 200+ placement drives were made by top brands including 100+ drives for technology & sciences’ students and 60 for business administration students. Under these drives, LPU students have got placements in different sectors including Management, IT, Engineering, Banking, Agriculture, Consultancy, Architecture, Pharmaceuticals and other. By recruiting 550 students in a single drive, IT giant Cognizant once again remained top recruiter across all the sectors and clusters. Cognizant has set new record of consecutive selection in large number in North India, after selecting 610 students previously. It is followed by Tech Mahindra’s selection of 249 students, I Gate Global Solutions’ 73, and in similar number by many other companies. Though companies from multiple sectors have recruited LPU students but the top sector to recruit largest number of LPU students again remained engineering. 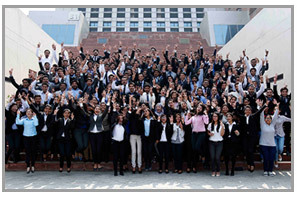 LPU School of Hotel Management led the race illustratively by witnessing 100% placements of its students. Management students are selected by globally giant companies including XL Dynamics (75), Think & Learn (33), Practo Technologies (32), MRF Tyres (13); engineering students by CSS Corporation (30), and so on. Pharmacy students are preferred in large number by prestigious companies including Torrent Pharmaceuticals, Abbot India, Jubilant Chemsys, Life-Cell International, Omics Group; Hotel Management students by ITC Hotels, Bercos, The Grand, Zuri Whitefields; Fashion Technology students by Tommy Hilfiger, Biba Apparels, Madura Fashions, Vardhman Polytex; and agriculture students by Zenesis Agro-science and more. Education and physical education students also got coveted placements by Leap Start, Akal Academies, Focus Academy, and Imperial Sports Academy, Kooh Sports, Decathalon and more. PhD basically a doctorate awarded for original contributions to knowledge. Look at here phd dissertation writing service it surely help students in their studies.